Last updated 15 March 2019 . By Faith Strickland. Bread Street Kitchen is taking off with their new space ship pop-up. While he might be most famous for creating the iconic 'idiot sandwich', Gordon Ramsay is not just an inventive genius with insults, he also knows how to slay a pop-up. Last Christmas, I was trying not to lick the walls of the gingerbread house at York & Albany, and now his latest offering has landed. 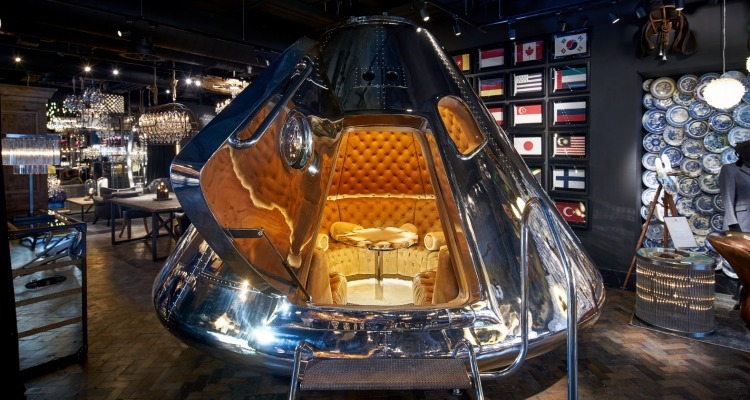 Street Lounge at Bread Street Kitchen is a life-size replica of an actual space capsule, but with luxurious velvet interiors and a marble-topped table - we hopped down for a spin. As the flagship, Bread Street Kitchen is always hustling and bustling with post-work drinkers and diners, but once inside our metal craft, the din seemed to float away. The dining experience has teamed up with Bacardi to offer a smart afternoon-tea style meal, with tiers of treats alongside a Spring Negroni, which bartender Dennis boarded our ship to show us how to make. From butter soft tuna tartar that melted against a snap of wonton crisp through to mini pork sliders, stuffed with sweet apple slaw, the food was out of this world - and had us fighting for every last scrap. Whether it's a date, birthday or just a get-together, Street Lounge will have you flying high with mouth-watering dishes, fresh cocktails, and a private dining experience you won't find anywhere else on this planet. Street Lounge is taking place at Bread Street Kitchen. The ship can accommodate up to eight people for three-hour + time slots; tickets cost £50 and include a multi-course sharing platter and Spring Negroni. Book in here.